Spark Academy offers GST Training in Chennai. Sometimes, with client requirement we do offer GST training to students on a free basis. We, as an organization is registered with MSME which comes under Govt in India. We provide the GST course completion certificate with our registration number. Spark Academy is the best place where you can learn about Goods and Service Tax. GST Training Courses in Chennai, Goods and Service Tax Classes GST Training Courses in Chennai. 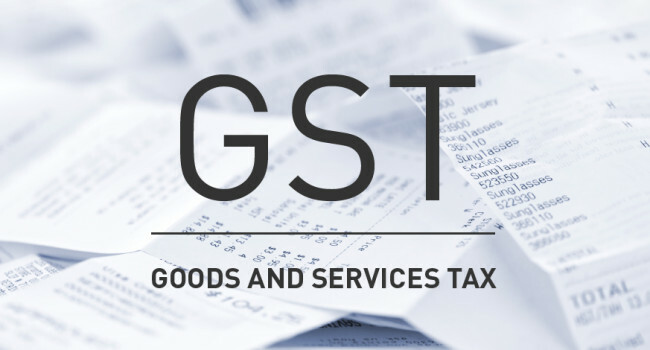 Goods and Services Tax or GST is a single tax that will subsume several indirect taxes that are currently levied on the sale of Goods and services. Apart from the regular GST training we were earlier offering our Taxation Course in Chennai. GST will be applied to the manufacture, sale and consumption of all goods and services in India and will come into effect from July 1. Why GST Training in Chennai? Our GST Training in Chennai is handled by experienced CA’s. GST will be applied to the manufacture, sale and consumption of all goods and services in India and will come into effect from July 1,2017. We provide comprehensive reference material for our GST Training in Chennai course. The current tax system gives businesses a tough time as it involves multiple taxes, complex compliance procedures, and intervention by several state and central tax divisions. This makes it highly difficult to setup a business in India which already stands at 133rd position when comes to doing business. Spark is one of the best places learn GST Training in Chennai. In the current indirect tax structure, up to 20 taxes are levied by the state and the central government before a product reaches the end consumer. At each stage of a supply chain, taxes are applied on the total value of the product, even though it has already been taxed at the previous level. This process of taxing already taxed goods is referred to as tax cascading. This happens when the government fails to provide credit for input tax (the tax that was paid at the previous stage) to the consumer who buys the product in the next stage. This heavy tax cascading increases the amount of tax involved in the making of a product, which often is included as part of the manufacturing cost. This shifts the entire tax burden on the end consumer, who will pay upwards of 30-35% in taxes by the time they buy a product. When goods are moved from one state to another, a Central Sales Tax (CST) of 2% is collected on the total value of the goods at the state border. For example, if you have a textile showroom in Chennai and buy garments from Surat, the truck carrying the consignment will be charged a CST of 2% for each state border it crosses. This amount gets added to the cost of the garments that you buy from the manufacturer. On top of all that, the constant taxing of interstate goods delays their arrival, as time is wasted at tax checkpoints at each state border. A lack of a uniform tax rate across the country means that Indian businesses today have to comply with multiple tax laws, follow various different tax rates, and face intervention from tax authorities from many states. Businesses that sell goods across states have to maintain a separate record to manage costs according to each state’s tax rate, as well as manage piles of paperwork specific to each state’s tax laws. Failing to comply with all of these rules puts businesses at risk for heavy penalties from the tax department. All of this additional work makes managing interstate taxes complex and stressful, and it often consumes a considerable amount of time, money, and resources. 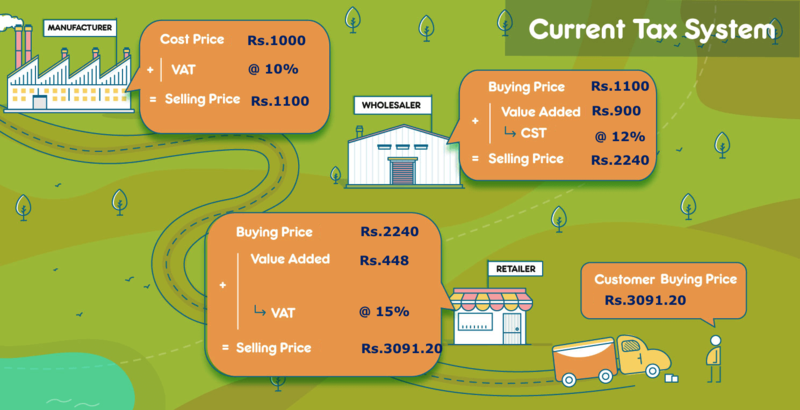 Instead of applying taxes on the total value of the product at each stage, the GST only imposes tax on value addition. Because it provides credit for the input tax paid at each previous stage of a supply chain, this method considerably reduces the overall manufacturing cost. We offer some of the best GST Training in Chennai. Note: In this example, we are assuming that all taxes associated with the manufacturing process have been paid and the selling price in the first stage is the final price set by the manufacture (excluding VAT). Imagine a manufacturer selling zinc coated steel buckets, each for Rs.1000 plus a VAT of 10% (which is Rs.100) to a wholesaler located in the same state (let’s call it State 1). So, the wholesaler at state 1 buys them for Rs.1100 per piece and increases the total selling price to Rs.2,000 per bucket before selling a few of them to a retailer located in a different state (State 2). Under the pre-GST regime, this interstate sale will attract a Central Sales Tax (CST) of 12% on Rs.2,000 (which is Rs.240). The retailer pays Rs.2240 per bucket and then increases its price by 20% (which is Rs.448) and then offers it to local consumers (who are also at state 2) for Rs.2688 plus a VAT of 15% (which is another Rs.403.20). The end consumer ends up paying a total of Rs.3,091.20/- per bucket. In the above example, you can see that at every stage of the process, the application of tax is non uniform and the process of getting ITC is broken by the presence of different taxes governed by different authorities. Bottomline – Sellers lose money on taxes at every stage as they don’t get input tax credit or refund on the tax paid on purchase whenever they make a sale. Learn how to create GST returns and invoices for the taxes collected and how to pay the taxes. Spark Academy or Email us through the form below!! I am a B.com graduate having 6 years of experience in accounts and direct taxes. Will I be able to do this course? Do you conduct your GST Training in Chennai more practical way? We have sent you the details for the GST training course to your email. Yes, we will be taking the GST course in a more practical way. The details are sent to your email. Our GST coaching classes in Chennai are practical which includes GST registration, Input tax credit, GST filing, etc. I am working in a manufacturing company and I came to your website looking for GST practitioner course by government. Are you providing GST training in Chennai by Government? I am looking to learn practical GST filing classes in Chennai. I am a B.Com graduate having 7 years of experience in direct taxes and new to indirect taxes. I have emailed you the details. Kindly send me the details for the GST certification course in Chennai. Yes we are providing the practical GST filing classes in Chennai. We are MSME registered organization and conducting GST certification course in Chennai. Our tutors who are chartered accountants, handle the classes. Our GST course in Chennai comes with practical GST filing in Chennai. Our auditors are experts in the areas of indirect taxation and are GST practitioners. You can always rely on our GST training course in Chennai. In the meanwhile, we have sent you the course details along with batch schedule to your email address. Kindly check the same and reply with your doubts. I want to do GST training course in Chennai at Spark Academy. I read through the reviews and I find it very credible. Do you provide GST returns filing in Chennai through Online? Will your syllabus contains Input tax credit also sir? Kindly send me the details. I want to do the GST certification course from your institute. Thank you for your inquiry. We have sent you the details to your email address. Kindly check the same and reply to us for any clarifications.